Assembled by each couple, these baskets full of their favorite things are truly one-of-a-kind. 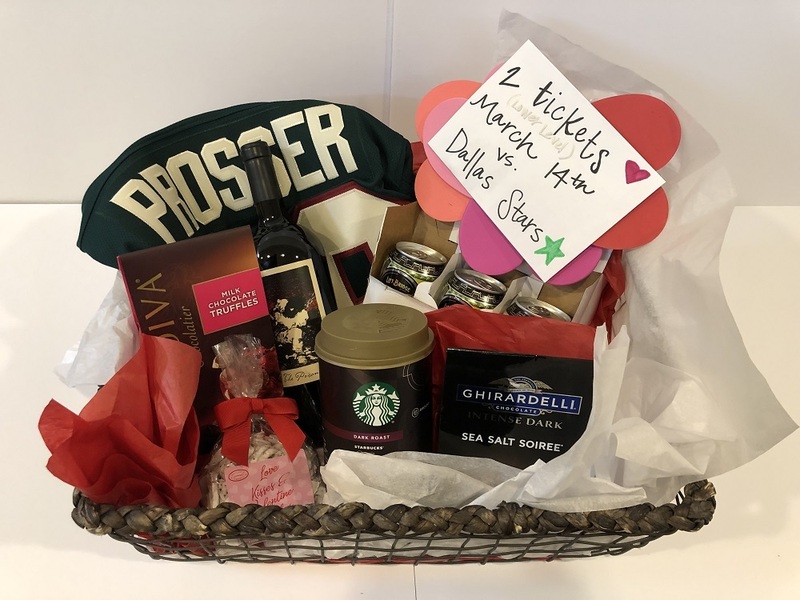 Nate & Brittani Prosser's basket includes: two (2) lower level tickets to the 3/14 Wild vs. Dallas Stars game, a bottle of The Prisoner 2017 Napa Valley Red Blend wine, Godiva Chocolatier Milk Chocolate Truffles, Yogurt Pretzel hearts, Ghiradelli Chocolate Intense Dark Sea Salt Soiree, Starbucks Dark French Roast coffee, a six-pack of Prosser's favorite beer (Lift Bridge Hop Dish IPA, Lift Bridge Farm Girl, Excelsior Brewing Company Big Island Blond, Fulton Lonely Blonde, Modelo), and an autogaphed green Wild jersey (size medium). Proceeds benefit Women's Advocates, a local domestic abuse shelter.